A 40 year old Scientist working in BARC Mr. K. D. (Patient identification number- 9093) visited our clinic on 18th November 2006. He was suffering from Vitiligo which was bilateral symmetrical in pattern on elbow, knees, finger tips and lower lips. There was increase in spots since past 1 year. He was taking cortisone, tablet. betnesol 20mg once daily and mometasone cream for local application. The spots were gradually increasing in number as well as size. He liked milk and disliked spicy food. He had no complaints in urine, perspiration, bowel movements and sleep. He had average appetite and thirst. He was working in BARC as a scientist. He lived with his wife. He got married 2 years back and his wife was pregnant. His parents and younger brother lived in village of West Bengal. He was shy and reserved by nature. As an elder son he had always taken up responsibilities of his home. He was anxious about his illness since 1 year. He had harmonious marital life. His mother was suffering from high blood pressure. Dr. Shah prescribed him research based medicines after studying his case in detail. 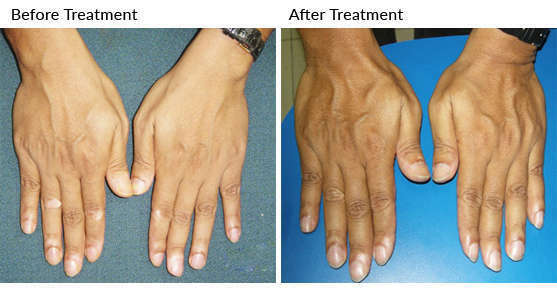 It was explained to the patient that his case would take time to recover as he had Vitiligo on muco-cutaneous junctions which are difficult areas to treat and medicines help in treating the existing spots to certain extent, controlling the spread and aim at preventing any new spots from occurring. He had consumed cortisone for one year which was another hurdle in his case as Cortisone is an immunosuppressive medicine. It suppresses and alters the immunity, making one prone to have relapse of the same disease with more intensity. He visited for his first follow up on 26th March 2007. He reported that he had tapered cortisone medication and he has not got any new spots after that. Although his old spots did not show any improvement. Dr. Shah prescribed him enhanced dose. On 27th July 2007 he reported for his second follow up. He reported that his Vitiligo had been stable since last follow up. There was no increase in new spots. On 16th November 2007 he was glad to report that his Vitiligo spots had faded slightly on lower lip and finger tips. There was mild improvement on elbow and knees. On 29th March 2008 he reported that his elbow and knees had started showing mild re-pigmentation. The patient continued the treatment for a year to prevent spread of Vitiligo and he was glad with the results he had attained as he improved more than what he had expected. This case is an illustration of Vitiligo on muco-cutaneous junctions which are difficult areas to treat and medicines help in treating the existing spots to certain extent, controlling the spread and aim at preventing any new spots from occurring. Uploaded on 16 September 2013, by DR. I.R.